Looking for great tailgating or sports watching recipes? 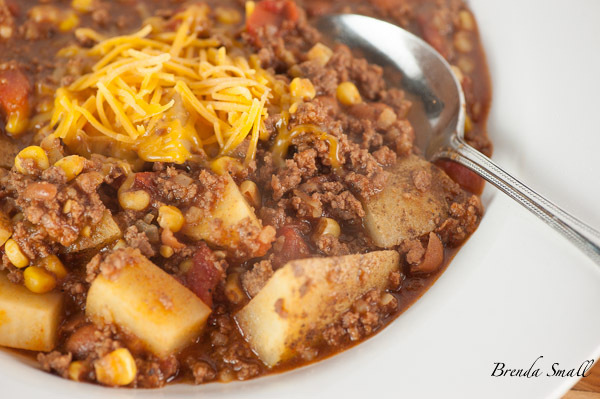 This quick and easy Cowboy Beef and Vegetable Stew is hearty like traditional Chili, but the addition of corn, potatoes, beans and green chiles makes it even better! Guaranteed to become a regular recipe on all of your menus. Your “food fans” will love you! This awesome Cowboy Beef and Vegetable Stew makes a great last minute meal, as you can keep all of the ingredients either in your pantry, in your freezer or in your vegetable basket, and it is a breeze to prepare. I have no idea when or where I got this recipe. All I do know is I have been preparing it as long as I can remember. When Joel was in dental school, he was working 2 jobs, and I was working full time. Even at that, we were still always “in the red” at the end of each month. I loved to cook, but as we were always on a very tight budget, I had to be creative with my menus. This recipe was in my regular rotation, along with Tuna and Noodle Casserole, Taco Salad, Hamburgers and Coke Chicken. 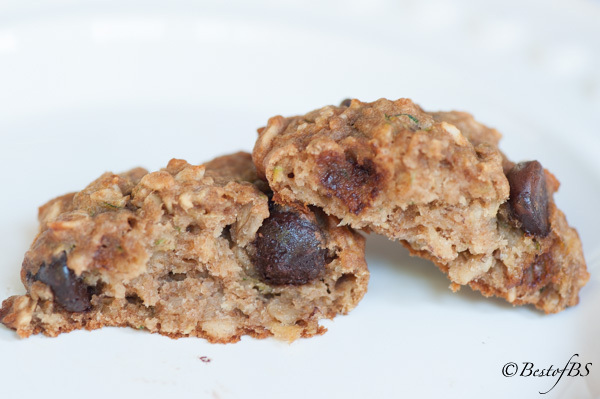 Those recipes were all inexpensive and quick to make, which made them great for week night meals. Then, when the kids were living at home, and I was always on-the-go with 3 kids all playing sports, helping out with Joel’s endodontic practice, volunteering and entertaining, this was one of my “Oh, c@#*, I have nothing to make for dinner!” meals. 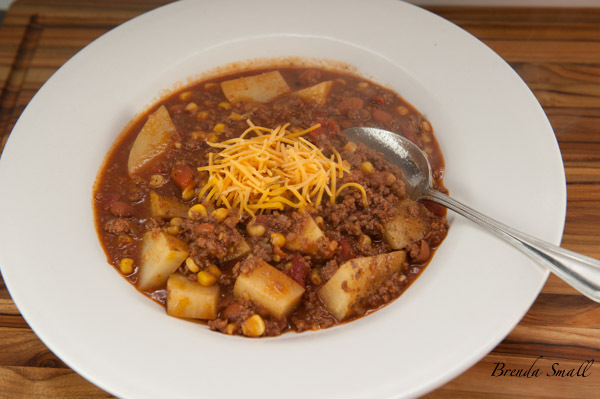 I made sure I always had the beef broth, tomato soup, canned tomatoes, canned or frozen corn, Ranch-Style beans and chopped green chiles in the pantry, ground beef in the freezer and potatoes, onions and garlic on hand. 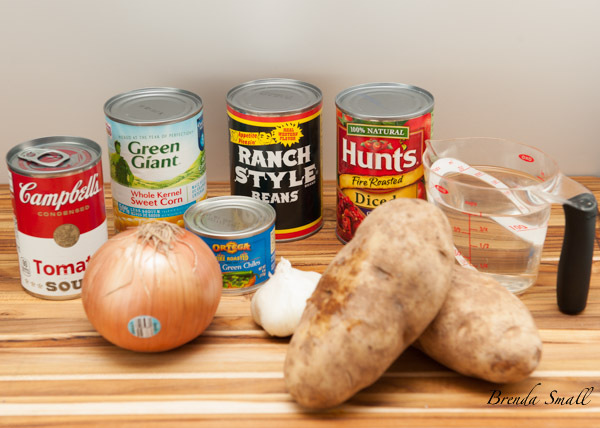 These are the ingredients you will need (with the addition of ground beef and beef broth, if you choose not to use water) to prepare the Cowboy Beef and Vegetable Stew. You could possibly have most of the ingredients in your pantry. To prepare this Cowboy Stew (For short), you simply brown the ground beef, chopped onions and minced garlic. (FYI: When I am making this for an adult crowd, I like to throw in a fresh, minced jalapeno when I am browning the ground beef, onions and garlic.) 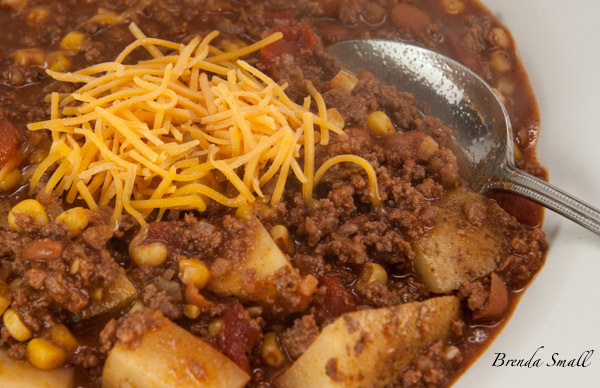 When the ground beef is browned, stir in the cubed potatoes, tomato soup, canned diced tomatoes, corn, Ranch-Style beans, and green chiles. Simmer, adding the broth or water to keep the stew from becoming too thick. About 1/2 to 1 hour later, an awesome meal is ready to devour! Whip up a pan of my Old Fashioned Cornbread or Hatch Chile Cornbread, and you are the “queen of meals that almost magically appear on the table”! This is a very “kid friendly” meal. It’s also great for small or large casual gatherings…and don’t forget that it is great for tailgating or “pot luck”, as it will travel well in a crock pot! I think it is a really good alternative to traditional Chili. Drain any grease off of the browned meat mixture. Add the potatoes, soup, tomatoes, corn, beans and green chiles. Stir until thoroughly combined. Lower the heat to medium-low, cover and simmer, stirring occasionally, about one-half to one hour. If necessary, add the broth or water to prevent the stew from getting too thick. Check for seasonings, and add salt and pepper if needed. Serve with finely shredded Cheddar or Mexican Cheese, finely chopped sweet or Purple onions, thinly sliced green onions, sliced, canned jalapenos or fresh, sliced jalapenos. I hope this Cowboy Beef and Vegetable Stew will be as popular with your family as it has been for years with mine. 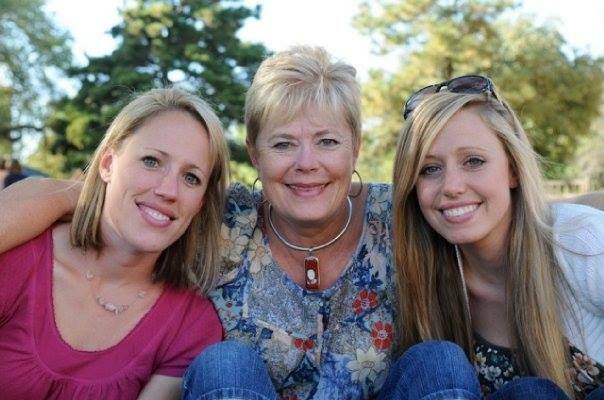 My girls now prepare it for their families. Zach even called me for the recipe a few weeks ago. Any questions or comments, please respond in the comment section below.